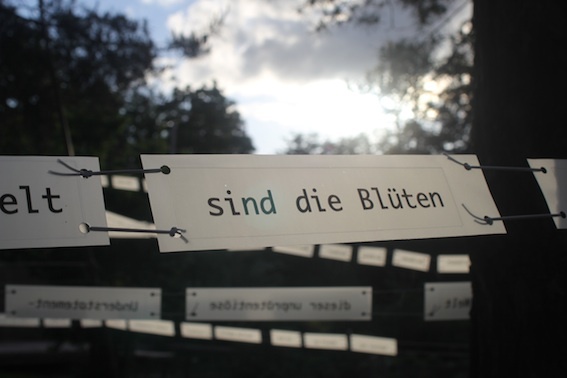 „Archaeology of Memories“ of Hungarian artist Séra Ildi, is an installation made of words and air, aims for showing the hidden stories floating around in the streets and places of Zurich. The artist had been collecting memories of inhabitants & visitors of Zurich for months; in internet-communities and also in a special Post-box of Memories at the Theatre Gessnerallee in Zurich. These stories are about moments of everyday joy, about quiet and unquiet pain, boxes of magnesium flying through closed windows, the ballroom Josefwiese, lines of saliva between the mouth of a man (father) and a woman (mother), about a rabbit in the Helmhaus, the understatement-richness of the city, about poetic and concrete bleedings, and a hopeful purchase of a bear soap. She absorbed the memories, cut the sentences apart, put them together again, in order to create skeletons of stories. 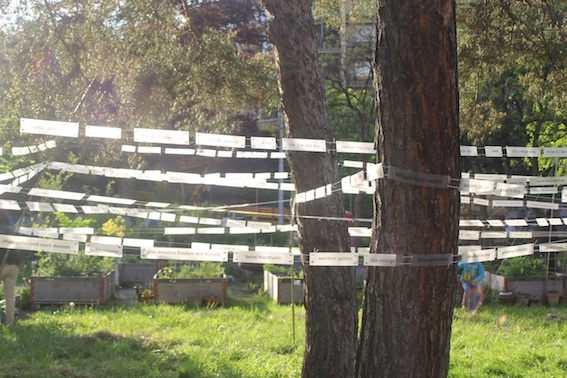 The words had been printed on labels, thread on thin ropes and stretched between 2,5m high bamboo sticks, creating a physical space with the three spruces of Merkurgarten, which is though also an imaginary space, containing fragments of memories of unknown people. The audience can pass through the created „real” space, while putting words and stories together in a new way, experiencing the installation, imagining the memories of others. 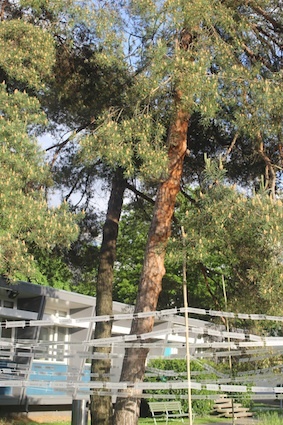 At the opening event Séra Ildi realized a moss graffiti action together with the visitors. Connected to the artwork, she cooked an alphabet soup for the buffet. At the artist talk Ulrike Felsing, assistant professor at the University of Fine Arts, Bern, was talking with Séra Ildi about her work in the fields of public art / installations.